Can we talk about global warming for a second? I was told there would be melting icecaps, rising seas, growing deserts and millions of people dying from lack of food. I was told that rising temperatures would cause massive disasters across the world. Hell, New York should be under water. I was kind of looking forward to that. But then again, I was told in the 80s we were all going to freeze to death as an ice age descended on all of us. Neither happened. So disappointing. But Al Gore is still blowing hot air. Al Gore: Freezing is the new warming. What I am seeing, however, is the Sahara Desert receiving snow for the second year in a row. The largest hot desert on the planet spans 3,600,000 square miles and is not the usual place for a sprinkling of snow. Now, of course Al Gore was jumping all over this, calling it a “climate crisis” and saying that this is what “climate change looks like,” but is that really the case? Of course not. It snowed there on December 19th. In higher regions there, snow can fall on a regular basis during the winter and subzero temperatures are not uncommon. But snow falling on part of the sand dunes which span thousands of miles is much more unusual. But it’s not a sign of the coming climate apocalypse. Algeria hosts part of the Atlas Mountain range, which extends some 2,500 km across northwestern Africa. The mountains get a lot of rainfall and they do get snow in the higher elevations. There is a surprising amount of snow sports available in the country, but snow does not normally reach the sand dunes. 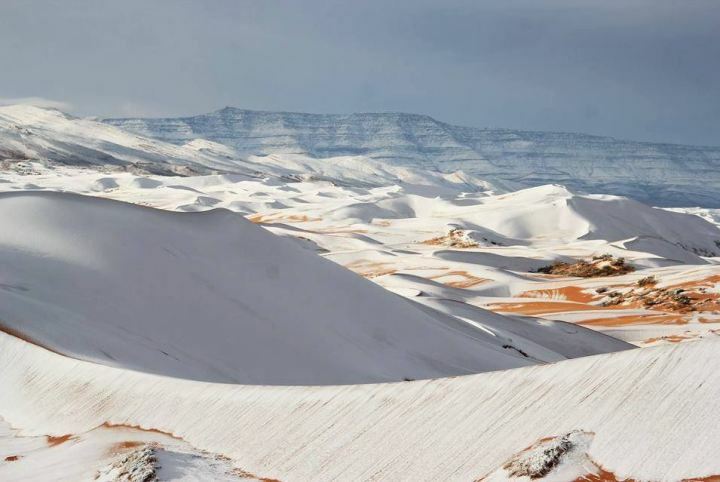 For the second time in almost 40 years, in the Sahara Desert (specifically Ain El Safra in Algeria) snow has fallen on the dunes, painting them a gorgeous white with the red sand peeking out from beneath. This is something that I haven’t seen in my lifetime, but it has happened two winters in a row now. It’s quite striking and beautiful. The last time snow was said to be seen in Ain Sefra before these last two snowfalls was on February 18, 1979, when a snow storm lasted for half an hour. It makes you wonder what is really happening. Are we heading toward “global warming” so intense that we become hell on earth, or are we closer to an ice age? (I’m sure most of America this winter will certainly be leaning toward the latter.) Or is it neither? Pretty much the last choice. But if you listen to meteorologists, we are always either about to burn up or freeze to death. Meh. That’s their business and their way of making a living… they get paid per catastrophe. I’m joking, but it does seem that way sometimes. 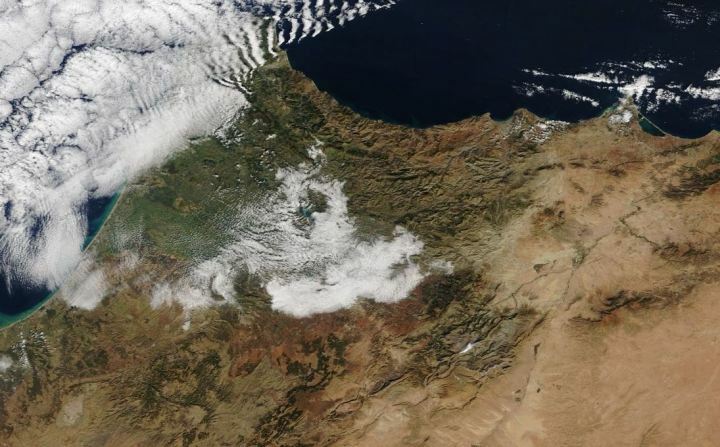 The snow could be seen from NASA’s TERRA satellite image service and it covers a rather large swath of land. Certainly more than you would expect from the Sahara Desert, which we were all taught in school is one of the driest, deadest areas on the planet. So, who else would love to buy Gore a one-way ticket to the Sahara just so we can watch him trip over his own tongue, while he tries to explain why there is snow in this particular desert? I would propose that be streamed live on PPV and the money made from the viewings can go toward easing our national debt. This in a win-win scenario for conservatives and everyone who knows that the climate change outrage is nothing more than the left’s attempt to fear monger people into obedience and make money. They want to tell us what to eat, what car to drive, where to travel, etc. And what better way to do that than attribute certain foods, vehicles and locations to climate change? At the end of the day, the agenda is all about control and we can’t let them get the upper-hand in the debate. One really good way to do that is watch what Mother Nature herself does. Snow in the Sahara seems like a pretty legitimate argument. And it’s cyclical folks. Yep, it’s strange to have two winters in 40 years with snow in the Sahara, but it’s due to weather patterns on this planet. Something that Al Gore either can’t grasp or is more likely scamming everyone on.